As the last of the Kula Plate decayed and the Farallon Plate advanced back into this area from the south, it brought with it the next and final chapter in regional geologic evolution: the Cascade Episode. This episode takes its name from the Cascade Arc, which spread up the coast with the Farallon Plate over Eocene time to reach the Pacific Northwest by about 37 million years ago. Supported by the subduction of the last remnants of the Farallon Plate (now called the ìJuan De Fucaî Plate), this arc has persisted into modern times, extending the length of the plate from Mt. Garibaldi in British Columbia to Mt. Lassen in northern California. Over the last 37 million years, the Cascade Arc has been erupting a chain of volcanoes along the trace of the modern Cascade Range in Washington and British Columbia. To the south of Snoqualmie Pass, the remnants of those volcanoes are the dominant rock of the modern Cascades. A good example is the large Ohanapacosh Formation, which underlies much of the area around Mt. Rainier. To the north of Snoqualmie Pass, owing to greater uplift, the surface volcanoes have long since been eroded away. Here, the plutonic ìrootsî of those volcanoes outcrop in the large Chilliwack Batholith, the smaller Cloudy Pass Pluton, and the Snoqualmie Batholith, among others. In Oligocene and Miocene time, these probably supported large surface volcanoes. It is important to realize that that the accumulation of these Cascade Arc volcanic and plutonic rocks is not the origin of the modern Cascade Range. The modern range is a much younger feature dating from only the last 5-7 million years. The volcanoes of the Cascade Arc before that time occupied positions along a divide of only modest relief, one that did not constitute a major weather barrier. The old volcanoes left us quite a geologic record, however: Mudflows off these old volcanoes appear in the ~ 25 million year old (Miocene) Blakely Formation around Issaquah, and in the Ellensburg Formation (of roughly the same age) on the other side of the modern range. To the west, the Olympic Peninsula region remained below sea level until at least mid to late Miocene time, perhaps 15-20 million years ago. The Farallon Plate finally reclaimed dominance in the Pacific Northwest after the Kula Plate fragmented.The last remnant of the Farallon Plate, now called the Juan de Fuca Plate after a Spanish explorer, began subducting along the western margin of Washington. Melting of the Juan de Fuca Plate at depth intruded magma into the continental margin to form the Cascade Arc. The îblobî of volcanic rock riding on the top of the Juan de Fuca plate is the Crescent Basalt, unsuccessfully trying to subduct beneath the continent. These rocks were uplifted to form the Olympic Mountains. The Pacific Northwest has been undergoing pretty much continuous deformation of one kind or another for its entire history. Particularly over the regime of the Kula Plate, the major tectonic features developed along northwest-southeast lines. These included an extensive network of faults developed over the Coast Range Episode, and a parallel set of folds, which strongly developed over the Challis Episode. These northwest-trending folds and faults are the primary deformational features across much of the region. Over the Cascade Episode, the development of many of these features continued, supported by a strong northerly component to the interaction of the Juan De Fuca and North American Plates. In this arrangement, the Challis-age southwestern half of Washington is driven north against the older, more stable terrane belts. Continued folding and slipping along these northwest - southeast trending features continues today. The west-northwest trending Seattle Fault is one of these features, active over the past several hundred years. Over the Cascade Episode, in response to these tectonic forces, large crustal blocks within the margin here have undergone significant (largely clockwise) rotation. This is most pronounced along the continental margin in the Olympic Coast Belt, and probably extends east into the Puget Sound Basin. The most dramatic events of the Cascade Episode occurred not along the Cascade Arc, but to the east on what is now the Columbia Plateau. From fissures located in northeast Oregon and (probably) southeast Washington, vast quantities of very fluid volcanic rock, basalt, erupted out onto the surface. Between 17 and 13 million years ago, immense floods of basalt repeatedly inundated what is now eastern Washington and Oregon, flowing west in some cases all the way to the Pacific Ocean. These are the Columbia River Basalt flows, and they are the largest flood basalts in North America. The Columbia River Basalt is the largest continental basalt province in North America.The map at right shows the present distribution of the basalt. Undoubtedly, the basalt covered an even larger region before erosion removed large portions at higher elevations. Moreover, the Columbia River Basalt dips eastward along the eastern flank of the Cascade Range. 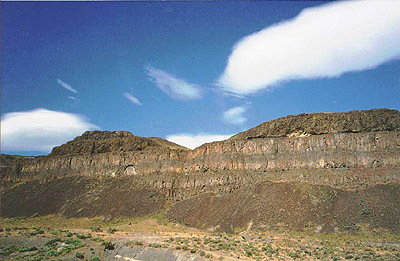 This indicates that the Columbia River Basalt are older than the Cascade Range itself and were uplifted and eroded as the modern range was uplifted 4 to 5 million years ago. Geologists have debated the origins of the Columbia River Basalt for decades. 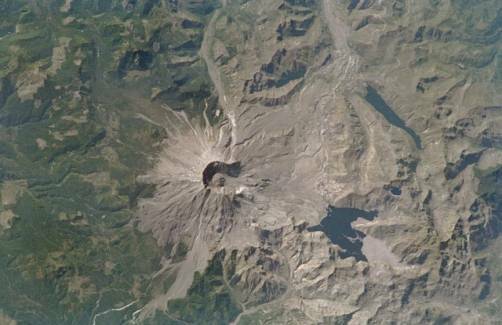 The eruptive center for these flows appears at the coincidence of two geologic features. One of these is the eastward-migrating Yellowstone ìHot Spotî which traverses through this area between 17 and 13 million years ago, before continuing to burn its way across the Snake River Plain and onto its present location at Yellowstone. This is a mantle-plume, much like in the Hawaiian Islands, except that this one now lies under our continent. It is not a comfortable arrangement. The other ìuncomfortableî arrangement here concerns the East Pacific Rise, a spreading center that the continent appears to have overridden. It heads under the continent in the Gulf of California and heads north. Extension along this feature has formed the Basin and Range Province of Nevada, Colorado, Arizona and New Mexico. The axis of that spreading center extends north into eastern Oregon, at the source of much of the Columbia River Basalts. We believe the the basalt flows erupted from the coincidence of the Yellowstone Hot Spot and this spreading center. One important aspect that changed late in the Cascade Episode was the status of the northern end of the Juan De Fuca Plate, a portion now known as the Explorer Plate. Between 5 and 7 million years ago, the Explorer Plate broke off from the Juan De Fuca Plate, along a transform now known as the Nootka Fault. This change apparently had some important ramifications for regional geologic evolution. When this change was completed, Cascade Arc magmatism returned and the modern Cascade and Olympic Ranges started to rise. The last of the Farallon Plate is now made of three small fragments:The Gorda, Juan de Fuca and Explorer plates. The Explorer Plate broke off from the Juan de Fuca plate between 5 and 7 million years ago.As it did, the Cascade Arc resumed and the modern Cascade and Olympic Mountains began to rise. When the Cascade Arc resumed 4 to 5 million years ago after reorganization of the Explorer Plate, there were some apparent changes along the northern end. Where the northern end of the arc originally extended due north from the modern-day location of Glacier Peak - into the Chilliwack Batholith and the Pemberton Belt in Canada, it now headed northwest into the Mt. Baker - Garibaldi Belt. This apparently reflects a steepening of the subduction zone on the northern end of the Juan De Fuca Plate. At the same time, the Juan De Fuca Plate assumed a more easterly-directed sense of motion relative to the continent. These conditions apparently initiated the rise of the modern Cascade and Olympic Ranges, sometime between 4 and 7 million years ago. As the Juan De Fuca Plate descended at a steeper angle underneath the margin of the continent, the continental edge started to fold in response to the increased friction between the plates. This friction is the source of our modern regional subduction-zone earthquakes, and is the major tectonic regime along the coast. The modern Olympic and Cascade Ranges are largely the crests of two parallel folds, with the Puget Sound Basin lying in the trough between them. Because these north-south trending folds superimpose on the earlier northwest-southeast trending set, an irregular crest line results, in what one venerable University of Washington professor describes as an "egg-crate" pattern.In the Cascades north of Glacier Peak, uplift assumes a more plateau-like character, merging with the Coast Range to the north and the Okanogan Highlands to the east. Uplift on the north end is perhaps 3 miles; it is perhaps 2 miles at the latitude of Snoqualmie Pass, and less to the south. Uplift in both ranges continues today. The modern Cascade Volcanoes (Mt. Garibaldi, Mt. Baker, Glacier Peak, Mt. Rainier, Mt. Adams, Mt. St. Helens, Mt. Hood, and peaks to the south as far as Mt. Lassen) are but the most recent in a long line of volcanoes that have risen over the 37-50 million year history of the Cascade Arc. As discussed above, they are somewhat incidental to the modern range of the same name. Mt. Baker is the most recent descendent in a long line of volcanoes tracing their ancestry back into the Oligocene Chilliwack Batholith. The modern cone is a very recent feature, perhaps 50-70,000 years old, built on the remains of earlier cones, some of which have very violent eruptive histories. Its most recent eruption was in 1880. 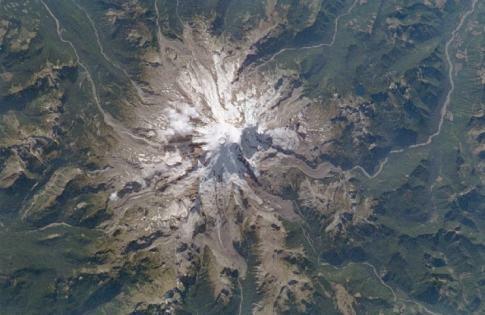 Glacier Peak is the most recent installment in a lineage of volcanoes dating back to the Miocene Cloudy Pass Pluton. It has not erupted in historic times, but has a colorful history of inflicting major changes in regional drainage patterns. Both Mt. Baker and Glacier Peak hold the potential for severe damage. Mt. Rainier is an older volcano of perhaps a million years, with a volcanic heritage dating back to the Oligocene Ohanapacosh Formation. It is a well-studied and very dangerous peak, with a grave potential for unleashing large-scale mudflows.Large-scale eruptions of this peak, which are a real possibility, would be a locally cataclysmic event. The 1980 eruption of Mt. 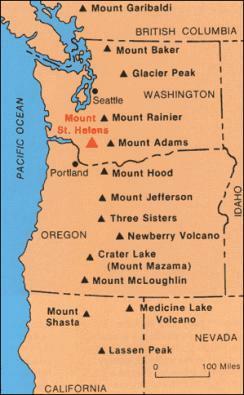 St. Helens, demonstrated only a fraction of Mt. Rainierís potentially violent capability. Mount Rainier is certainly the most dangerous volcano in North America. As the modern Cascade and Olympic Ranges rose, streams and rivers eroded to a point of thorough dissection of the landscape. Long before the great ice sheets of the Pleistocene moved across the land, the major geographic features (mountains, rivers, basins, etc) established themselves throughout the region. Over the past two million years, periodic episodes of glaciation sculpted much of that landscape repeatedly, a pattern that continues to the present. Due to a combination of changes in the configuration of the continents, the ocean basins, ocean currents and related phenomena, the world entered a series of glacial cycles about two million years ago, a cycle which continues into the present.At least four times over this period, large continental-scale glaciers have formed in what is now Canada, and have extended south across the border into the United States. These glacial episodes separate non-glacial periodsólike that in which we currently live. The most recent (and by all evidence the most extensive) of these glacial episodes is known as the "Vashon" locally, ("Fraser" to the north, and "Wisconsin" to the east). Ice from this episode advanced into Washington about 18,000 years ago, and receded just 10-12,000 years ago. Remnants of the great floods: Dry Falls, once one of the worldís largest waterfalls.Photo Credit: Jay Cousins. On the west side of the Cascades, continental ice advanced south down the Puget "trough,î turning Puget Sound into a vast inland lake. The abundant clays of the Puget Sound region are largely lakebed deposits of this age. Eventually, the ice spread as far south as Olympia, where all waters of the basin diverted south into the Chehalis river. Fourteen thousand years ago, the ice was three thousand feet thick over Seattle, nearly six thousand feet thick over Bellingham. The ice last retreated by about 11,000 years ago, leaving a legacy of clay, sand and gravel deposits across the region. 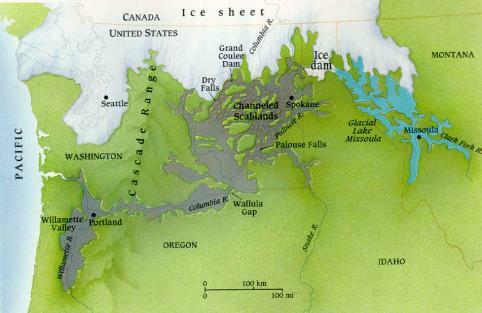 The east side of the Cascades experienced even more dramatic developments as the continental ice periodically advanced. Along the eastern slopes of the North Cascades, glaciers flowing out of the mountains repeatedly dammed the Columbia River, wreaking havoc as these dams periodically broke. On a much larger scale, ice descending the Okanogan Valley periodically dammed the Columbia at the Grand Coulee, impounding a vast lake, which ultimately flowed south though what is now called Dry Falls. At that time, they were one of the truly great waterfalls of the world. Even as such, they hardly held a candle to events to the east. Up in the northern panhandle of Idaho, the advancing Purcell Lobe of the continental icecap made a repeated habit of damming the very large Clark Fork River, which drained much of the interior of Montana. Behind this dam rose an immense lake, Lake Missoula, impounding vast quantities of water. Periodically that dam gave way, unleashing the waters of Lake Missoula on the world below. Noah himself would have been amazed. The unbound waters of Lake Missoula coursed out through the Spokane area and across much of the Columbia Basin are the greatest floods ever recorded. Ripping their way through the armored basalt flows; they carried house-sized boulders hundreds of miles from their sources. 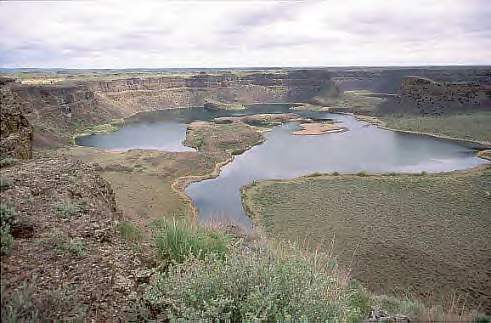 Carving the deep coulees of the "channeled scablands" across the Columbia Plateau, these waters converged through what is now Walulla Gap with a flow greater than that of all the combined rivers of the world. Maximum advance of ice into the Pacific Northwest. A lobe of ice has dammed the Glacial Lake Missoula in Montana. Periodically, the ice dam breached, sending the largest floods ever recorded through the channeled scablands of Washington and down through the Columbia Gorge. Image: Ice Age Floods Institute. Downstream, the floodwaters ripped their way though the Columbia Gorge, and impounded a huge lake up the Willamette Valley as it struggled to drain to the ocean. The savagely eroded scablands of the southern and eastern Columbia Basin are a stark testament to the greatest floods ever known. Aside from these episodes of continental glaciations, the Cascades and Olympics have seen an untold number of episodes of local alpine glaciations. The North Cascades in particular is spectacularly sculpted in classic alpine forms.Except in these high mountains, the last ice largely disappeared about 11,000 years ago. This is broadly synchronous with our earliest evidence for human habitation in this part of the world.